Get long-distance illumination from this seriously bright flashlight. 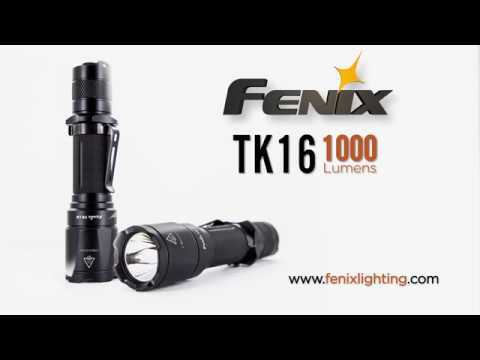 The Fenix TK16 has 4 brightness modes, single-finger switch operation, and a strobe mode. 1000 lumens of light reaches up to 240 meters, so you can trek through any dark situation. Powered by a 18650 (flat-top) rechargeable lithium-ion battery or 2, 3V CR123A Lithium batteries. Dual layer construction assures incredible conductivity and circuit efficiency. Tail switch for momentary-on function, easy and fast output selection, and strobe mode. Dual spring design offers better impact resistance and reduced carry noise. Includes holster, lanyard, 1 spare o-ring, manual, and warranty card.